At the point of scheduling (appointment or walk-in), MedsCK will guide the pharmacist through the eligibility check before confirming the booking. If the Integration option is selected, MedsCK will also automatically extract the consumer's dispensing history into their MedsCK profile. Integration version: MedsCK will automatically extract consumer dispensing history from your dispensing system database. Standard version: Manually entered consumer details are added to the local MedsCK address book. Performs a check to see if a MedsCheck has been provided in the last 12 months (within MedsCK). Medscope MRM users - MedsCK will check if HMR performed within the last 12 months. 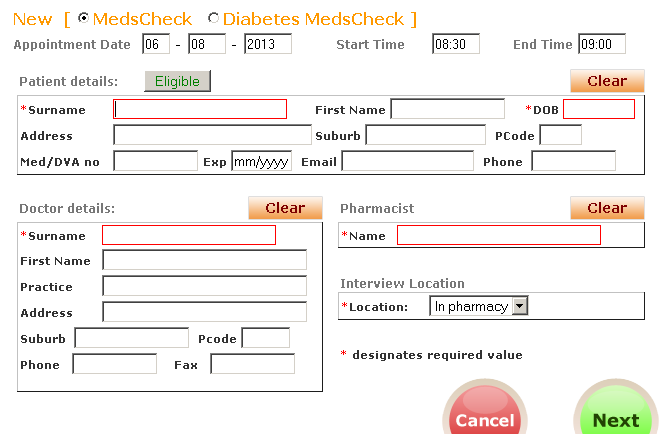 Automatically prints an appointment slip for the patient with appointment details. Automatically sends consumer SMS appointment reminders (if mobile number provided).